The US recorded its eighth consecutive year of international enrolment growth last year, expanding 8% in 2013/14 to reach a record high of 886,052 students. Those students generated an estimated economic impact of US$27 billion and accounted for more than 340,000 American jobs as of fall 2013. These are among the key findings in the 2014 Open Doors report released this week by the Institute of International Education (IIE) and the US Department of State’s Bureau of Educational and Cultural Affairs. All told, international students represented just over 4% of total higher education enrolment in the US in 2013/14. The US remains the leading international study destination and is host to roughly one in five of the world’s mobile higher education students. Looking just at year-over-year comparisons, in 2013/14 there were 66,408 more international students enrolled at US colleges and universities than in the previous year. Students from China, Saudi Arabia, India, Brazil, Iran, and Kuwait accounted for nearly all of that growth, with China and Saudi Arabia together accounting for 73% of the year-over-year growth between them. 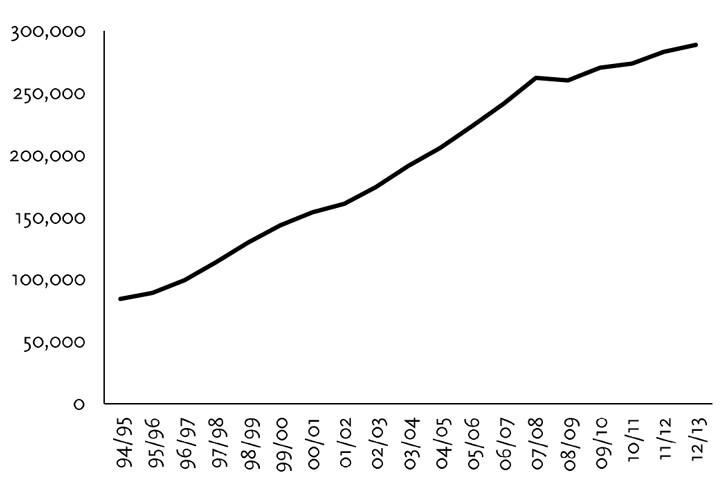 Chinese enrolment increased by 17% in 2013/14. The number of Chinese students at US institutions now exceeds 274,000, and students from China represent 31% of all international enrolment in the United States. Echoing recent data from the Council of Graduate Schools (CGS), which has reported two consecutive years of growth in admissions offers to Indian students, Open Doors 2014 reports a 6% growth in Indian enrolment for the year. This reverses a three-year decline in the numbers of Indian students at US institutions and amounted to nearly 103,000 Indian students in the US in 2013/14. 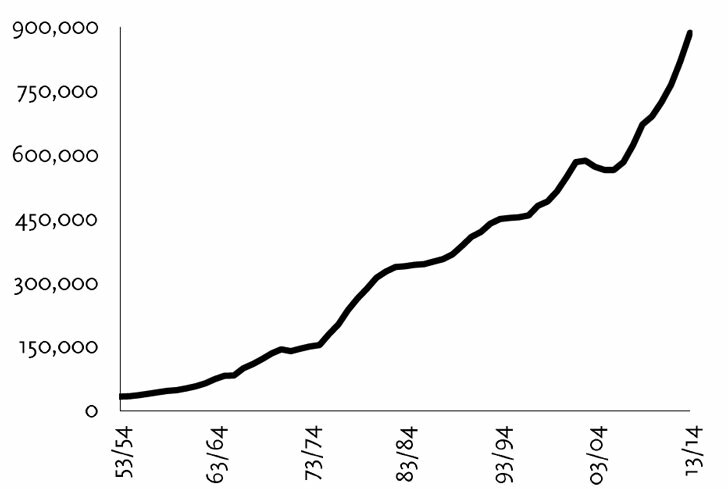 Also of note, the three fastest-growing source countries – Kuwait, Brazil, and Saudi Arabia – were all fueled in part by large-scale scholarship programmes for study abroad. Continuing the trend from the previous three years, undergraduate programmes again accounted for the bulk of enrolment growth in 2013/14. Graduate enrolments in the US, however, have strengthened over the past year and, as the following table reflects, this shows in stronger year-over-year growth for graduate studies in this year’s Open Doors data. The top fields of study for international students in the US remain Business and Management, Engineering, Math and Computing Science, Social Sciences, and Physical and Life Sciences. Those five subject areas alone combine for nearly two thirds of all international enrolments at US institutions. IIE reports, “International students contribute three times more to the US economy than they did 15 years ago, up from US$9 billion [in 1999/2000] to US$27 billion [in 2013/14] in tuition, room and board, books, travel and other costs.” The sector accounted for 123,465 direct jobs and 216,542 indirect positions, for a total of 340,007 total jobs supported in 2013. 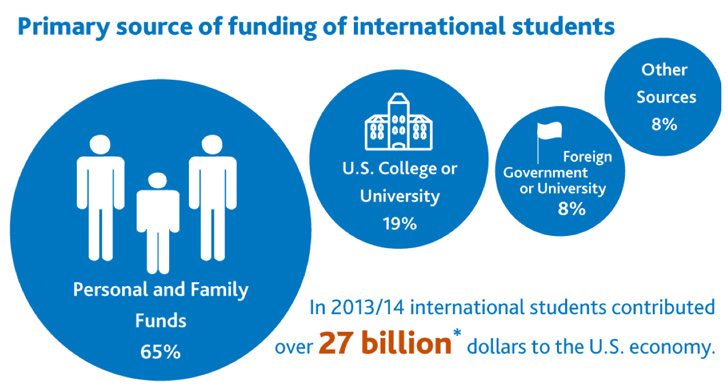 As the following graphic illustrates, 65% of the international students in the US in 2013/14 were self-funded. Another 8% were supported by foreign scholarships, and as many as 19% by scholarships from US institutions. For additional background, NAFSA has produced a more extensive economic impact brief based on the Open Doors data. IIE reports that nearly 290,000 US students went abroad in 2012/13. This represents a modest 2% increase year-over-year. As the following chart reflects, however, US student participation in study abroad has more than tripled over the past two decades. While 2012/13 represents a record-high level of participation, it still amounts to fewer than 10% of US undergraduate students with an international study experience before graduation. And most of those who do go abroad go only for a short time: as many as 60% of US students abroad pursue programmes of eight weeks duration or less. American students in STEM disciplines (Science, Technology, Engineering, and Maths), Social Sciences, and Business are among those most likely to study abroad. Those three fields of study respectively accounted for 23%, 22%, and 20% of US enrolment abroad in 2012/13, and study abroad by STEM students grew by 9% in 2012/13 alone. The UK remains the leading destination for American students, followed by Italy, Spain, France, and China. For additional background on the international mobility of international students, please consult the following infographic as well as the detailed findings on US study abroad from Open Doors 2014. This entry was posted in Agents, Higher Education, North America, Regions, Research, United States and tagged optional practical training, postgraduate student recruitment, international students, student recruitment agencies, colleges with international students.